How to remove, recover and replace the headliner in a 1992 Chevrolet Silverado truck. This Chevrolet truck headliner was "on the head of the owner"; so we took about 30 minutes and replaced the headliner with a headliner kit. It is now as good as new. 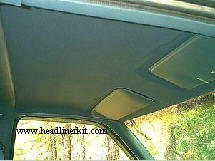 A standard cab truck headliner kit will do this vehicle, click this link to go to the order page. The color we used for this Chevy truck was 2187 charcoal blue. You can find this color in our color chart on all the truck headliner kits page. 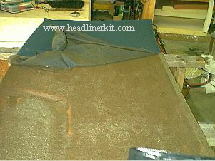 Remove the old material from the headliner board. 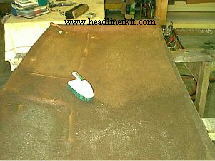 Now clean the board of all the old deterioated foam (it's like dust). You can use a softbristled brush bathroom brush. 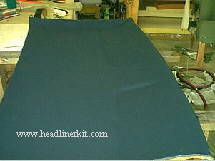 When the board is clean; place the headliner material on it...fold in half...spray material and board, and then glue it. 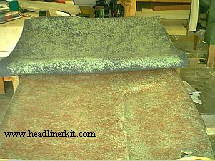 When gluing the material to the board...press with palm of hand and rub it firmly. After glued...trim excess. It should look something like this. Replace the headliner the same way it came out. LOOKS LIKE NEW!!! 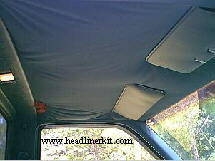 This is a nice tutorial for a “flat” headliner, but my 2005 Gmc std cab, has all kinds of concave areas, whats the trick in having no wrinkles in the fabric?? You can glue over the old foam, but make sure there is no foam dust left once you remove the material part of the headliner material. I would go over it with a soft bristled brush just to make sure. My foam backing is in great shape and is not coming off. Can I just glue the new cloth over the existing foam?